Copy of Minutes available in Club Room. Due to Safety considerations and available space on the track. The club have found it necessary to limit the number of athletes in the Academy Group. Therefore the club has a Waiting List for the Academy. For your child to be placed on the list, please contact the club by email with your contact details,. Can we kindly request that you do not come to the Dell on training nights, unless requested to do so. These Records are from 1974 Onwards when detailed Results became available. The award for November goes to under 17 athlete Harry Walters for an excellent performance in the Suicide 6 race around Baggeridge, finishing 7th. Darrell Bodin is Octobers A of M for his great run in the Snowdonia Marathon finishing in 158th place from 2243 finishers. Coaches and Team Managers please nominate any athlete who you feel should get the Athlete of the Month Award. Barbara has the forms..
3 DASH members took part in the Manchester Marathon on 7th April with some good times. Phil Boardman in 311th with a time of 2.53.17, James Wright 918th in 3.02.13 and Darrell Bodin 972nd in 3.03.02. Well done lads. A good solid team performance had the club battling with Halesowen for most of the race to finish in 5hrs 7min 43sec. The slower time is due to 2 short stages being replaced by 2 long, hence its a longer race. Here special mention must be given to Mark Judge, with a long leg, and Phil Nation on a short who stepped in to run the last 2 legs and complete the team. 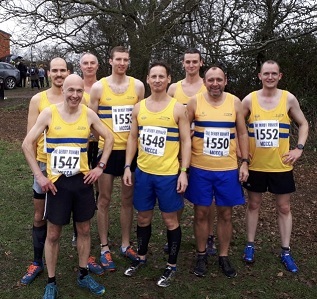 An excellent team performance on 24th March 2019 in the Midland 12 Stage Road Relay saw the club finish in 16th place from 58 complete teams with a time of 4hrs 29min 47sec. This is the first time DASH has qualified for the National since 1995. A long wait. Rob Meredith led the way home finishing in 2nd place in 27.59, with Trevor Osborne 4th in 28.14. Dave Nation was only 4 seconds behind with 28.14 and Elliot Jones in 9th in 29.33. DASH Senior Men's team finish 14th in the Midland Cross Country Championships on 26th Jan at Newbold Common Leamington from 33 complete teams. Dave Nation continued his fine form leading the team home in 67th in a time of 45.08, with Trevor Shaun Osborne 84th in 46.06. Next came Dave Ratcliffe 140th in 49.19, 167th was Darrell Bodin 50.48. Darran Bishop 181st in 51.29 and Martin Harrigan 225th in 53.50 was the scoring team. mark Judge was 227th in 57.07 and Greg Middleton 360th in 63.01. as 403 runners finished the race. Rob Meredith ran the Staverton 10 mile Road Race finishing 10th in 58min 26sec. The weekend of 12th and 13th Jan was a busy time for DASH athletes as the Seniors had their best team performance of the season finishing 7th, with good runs from Dave Nation and Tom Isherwood, 9th and 12th respectively. Trevor Shaun Osborne was 17th, his best placing and Rob Meredith made a welcome return from injury to finish 35th. Dave Ratcliffe in 58th and Elliot Jones 65th completed the team. The following day a small band of youngsters travelled to Rugby for the WMYACC League and all ran well. The final Hereford & Worcester Sporthall competition took place on 6th Jan and DASH Under 13 Boys came away with the team trophy. Well Done. several athletes are expected to be chosen to represent the League. DASH Christmas Handicap saw 38 athletes take part, with Sharon Bailey overall winner and the first 5km runner home, with Jenson Gregory in 6th being the 1st 1.6km back. Luke Bailey was the fastest boy on the 1.6km setting a new course record of 6min 5sec and Elly Lees quickest girl in 8.37. Fastest male on the 5km was Rob Meredith in 17.14 with Grace Slater fastest lady in 22.35. All times on the Results Page. The happy band of runners at the finish. Some good DASH runs in the 3rd WMYACC League race at Perry Park and on the Road. Under 15 girl Isabelle Plant improved 11 places from the previous round finishing in 14th place as did Luke Bailey in the U/13 Boys race with 18th. Again the U/17 men maintained the team position in 5th. The U/17 Team below-William Kay, Adam Bodin and Harry Walters. Meanwhile on the road, the seniors put in some solid runs. In the Snyed 10mile race Shaun Osborne was 7th in 59.31, Darran Bishop 34th in 65.24 and Mark Judge in 65.24, with 385 finishers. 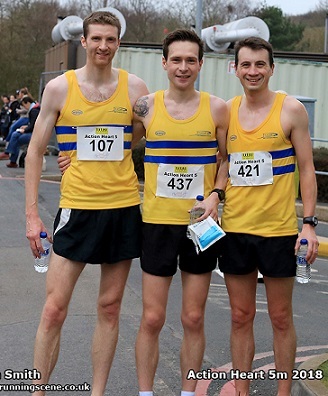 Elliot Jones ran in the fast, high quality Telford 10k. The first 17 all under 30 minutes, Elliot finishing in 288th in a time of 36.33 with 1243 finishers. Dave Nation was first home in 13th with Tom Isherwood right behind in 14th. Trevor Shaun Osborne was 26th, Darrell Bodin 75th, Dave Ratcliffe 88th and Darran Bishop completing the counting 6 in 109th. DASH are 8th overall. 16 year old Harry Walters runs well for an excellent 7th place in 40.10 with Elliot Jones just 10seconds behind in 8th. Dave Ratcliffe making a welcome return from injury in 23rd. The 2nd WMYACC League race took place at Warley Woods on 15/11/18. Ben Foster had a great run finishing 8th in the first League race in a time of 35.32 leading the team to 8th place. Ben was followed home by Trevor Shaun Osborne in 19th in 36.15 with Dave Nation just 3 seconds behind in 21st. Other scorers were Darrell Bodin 78th, Dave Ratcliffe 85th and Martin Harrigan 111th. Other places on the results page. Darrell Bodin tackles the scenic but tough Snowdonia Marathon. Middle Distance Coach Darrell Bodin had an excellent run in the Snowdonia Marathon on Sunday 28th October. In one of the toughest road marathons in the UK Darrells chip time of 3hrs 30min 58sec and position of 158th in field with 2243 finishers was a great performance. The 4 Stage Midland Cross Country Relays where held at Aldersley on 20th of October, with the DASH A Team finishing in a very good 19th place with the B Team in 39th. Details and times on the Results Page. The first WMYACC League race took place at Hatton Country Park. Although the club only had a small turnout, the athletes all ran very well, especially the U/17's. William Kay having moved up an age group finished an excellent 4th, with good support from Harry Walters returning from injury in 20th and Adam Bodin in 30th. The team finished 4th from 19 teams. Again Cian Wood and Rhys Lees finished close together in the U/13 Boys race for 71st and 72nd. Adam may still have had the Windsor Half in his legs after getting the better of his dad in a time of 1.24.25 with Darrell running 1.27.00. Again a good time for dad, considering Darrell's injury hit training. 2 weeks later in the Nationals with 76 teams finishing the relay, the club finish an excellent 61st. Think this is the first time the club have qualified for the National 6 Stage, so to put in such a solid performance, Well done to the athletes. 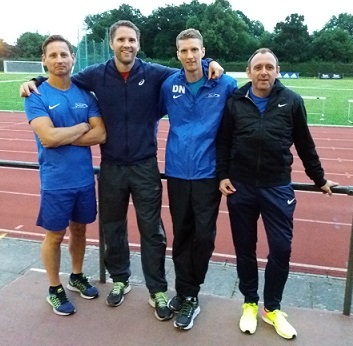 DASH Qualify for the National 6 Stage Road Relays. Three DASH youngsters ran well in the recent Dudley Schools Cross Country Championships, all qualifying to represent Dudley in the West Midland trials. Luke Bailey just missed out on the top spot, despite a fantastic final sprint and had to settle for 2nd place, a great performance though. Cian Wood and Rhys Lees put in strong performances to finish 9th and 10th. 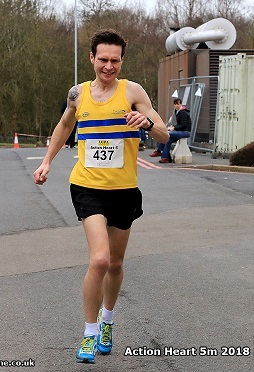 Following on his excellent 3rd place on Friday 6th April in the Fordhouses 5k in a time of 16.38, Rob Meredith stormed to victory in the 2018 Action Heart 5 Mile Road Race on Sun 8th April with a time of 27.26, leading DASH to a clean sweep taking the first 3 places. Ben Foster who also ran on Friday for 9th place, chased Rob home taking 2nd in 27.41, as Dave Nation completed the 1,2,3, with 3rd in a time of 28.04. Other DASH runners quickly followed as Elliot Jones finished 5th in 31.38, Darrell Bodin 6th in 31.41 and son Adam 13th in 32.57. Well Done lads and Coach Jim Brown for getting the lads in such good condition. The 1st 3 Dave, Rob and Ben and then all DASH below. Thanks to Neil and co for organising a great Awards Night, that I think everyone enjoyed, even those that lost money. The final Sports Hall meeting at Worcester took place on Sunday 17th December. DASH WON both Boys and Girls U/11 Events. Well Done to all those who competed and those selected to represent the Sportshall Team. Away from the cross country DASH walkers have performed well in the Winter Walks League with series medals going to Katie May finishing 2nd U/13 Girls. Stuart Edgar 3rd Handicap in the senior races, as the DASH team finished 2nd overall. John Gordon and Peter Cassidy completing the team. After 2 races in Div 2 of the Birmingham League DASH are mid table in 10 with 923pts. In both races Ben Foster has led the club home with Dave Nation and Rob Meredith close behind, giving the team a good start. In the 2nd race, Elliot Jones had his first run for DASH since returning to the club from W & B finishing an excellent 54th and 5th Junior. Martin Harrigan, Darrell Bodin and Simon Vines completed the clubs turnout. Nancy Hitchmough wins Double Gold in the European Masters Championships being held in Denmark in August. Taking the W65 age group 800m and 1500m titles and then helping GB to a Silver in the 4 x 400. 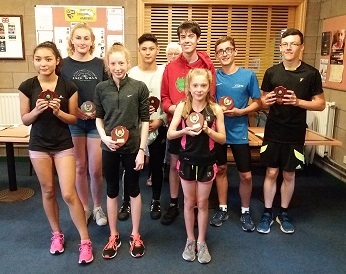 A fantastic performance by the younger DASH athletes in the Triangular League, after the 3rd and final meeting, the club won 6 of the 7 Trophies available. Well Done to all who took part and to Gill, Claire and Eric for organising the teams. The winners after being presented with the Awards by club President Wendy Cuff. In winning the Pentathlon at the Wenlock Games Emily Sherwood set a new games record of 3286pts. Well Done Emily yet another podium finish. At the 3rd Vets League DASH had a team in the Medley Relay for the first time since the 1990's. Its therefore a club record!!!! Phil ran the 400, Dave the 800 with Darrell and Mark the 200's. Shropshire 4 mile the June addition, this time Ben led the way home. Ben 6th 21.37, Rob 7th 21.39, Dave 21.46, Craig 42nd 24.02 and Mark 63rd in 25.46. The DASH Senior Men where well to the fore in the Lilleshall 5 Mile Road Race as Dave Nation came 6th in 27.27 with Rob Meredith 7th and Ben Foster 8th close behind, with both given the same time of 27.32. Great running with 385 finishers. The race is the 1st race of the Telford Sexarathon, only another 5 races to go. DASH runners formed a strong part of the Worcester Senior Men's team in the Inter Counties held at Loughborough on Saturday 11th March 2017 over 12km with Dave Nation 204th in 44.55, Ben Foster 225 in 45.31 and Rob Meredith 242 in 46.15 scoring for the team. Harry Walters finished 173rd in the U/15 Boys race with a time of 17.54. The Senior scoring 6. 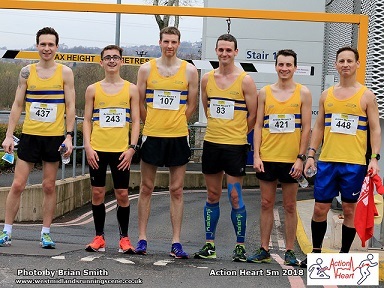 Sunday 5th February at the Action Heart 5 Mile Road Race, 3 DASH athletes where well to the fore, as an old member in Lee Slater won the race. Again Dave Nation got the better of Ben Foster taking 3rd in a time of 28.17 with Ben 4th in 28.28. Just behind came Rob Meredith for 5th in 28.57. Well done lads. A small band of DASH athletes travelled to Wollaton Park for the all important National Cross Country Championships. With 1762 finishers in the Senior Men's Race Dave Nation and Ben Foster ran really well for 409th in 47.55 and 415th in 47.57. Pretty Close. In the U/15 Girls Race Grace Slater was 293rd in 20.18 and Ellie Taylor 406th in 23.31. The Boys U/15 Race saw Harry Walters continue his fine season for 179th in 16.59, like Grace only 2minutes behind the winner. Adam Bodin was 324th in 18.59. A fantastic event to be part of. The following day the final WMYACC League race took place at Aldersley. DASH finished 14th overall from the 20 teams taking part. U/15 Harry Walters continued his good form for 10th on the day and 11th overall, just 1 point behind the 10th place runner. Other good runs from Grace Slater in the U/15 girls race for 32nd and 38th overall. Grace missed 1 race so would have finished a lot higher but for that. U/13 Chloe Everton despite a mixed season finished 30th O/A. On a flat and fast parkland course at Coundon Park Coventry, the final Birmingham Cross Country league race saw some great racing, it was not until the last 1 km the eventual winner managed to get clear. 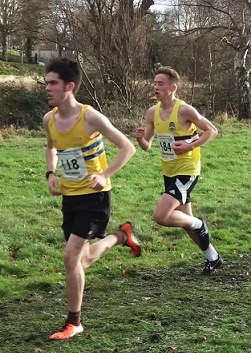 Likewise DASH athletes had some close races, as Dave Nation and Ben Foster battled all way round the 10k+course, with Dave coming home in 19th with a time of 39min 40sec, showing great consistency, his 3rd top 20 finish of the season. Ben never gave up the chase for 22nd in 39.46, Ben's highest placing. Getting closer to the top 30, Rob Meredith had his best run for 33rd with 40.47, as did junior Ashleigh Bentley who despite a cold, ran well for 86th place in 43.46. DASH's last 2 scorers, Scot Palmer and Dave Ratcliffe ran most of the way together, as both have had injury problems but wanted to support the team. Especially Dave normally a top 30 finisher, but he was out sprinted by Scot, who took 102nd in 44.23 as Dave was 107th in 44.30. Martin Harrigan completed the DASH runners in 143rd in 46.49. With 6 to score DASH finished 8th on the day so dropped 1 place to 6th overall, a good season. 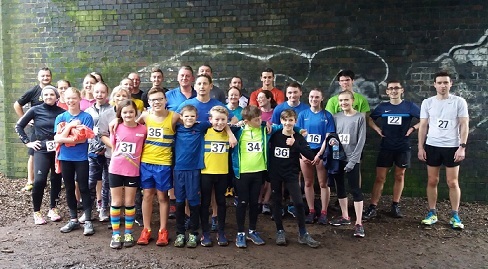 The 3rd race of Div 2 of the Birmingham Cross Country League took place over a very wet and muddy 5 1/2 miles at Lilleshall Sports Centre in January 2017, as DASH finished 6th team on the day, but remain 5th overall with just one more race to go. Ian Mansell had his best run of the season, finishing in 8th place, in such a high quality field this was a great performance especially with over 230 runners taking part, Ian was well backed up as Dave Nation finished 17th and Ben Foster ran well geting into the top 30 with 27th. Rob Merediith in 52nd, Scott Palmer 94th and junior Ashleigh Bentley 99th completed the team. Martin Harrigan in 114th and Eddie Fletcher was 216th. The following day a small group of the younger athletes made the journey to Northampton for the 4th WMYACC League race. Harry Walters had another good run for 10th in the U/15 Boys race, but all the runners deserve praise for making the effort. Harry Walters finishes 2nd in the U/15 Boys race at the Worcester CC Championships, leading the team of Adam Bodin and Alex Hurrell to 3rd place. The DASH Christmas Handicap 2016 could have done with a few more athletes, but those that ran performed well and Gill looks like she enjoyed it!!! 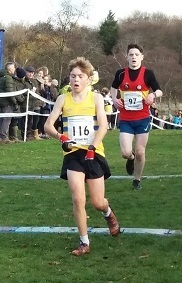 Harry Walters had a great run in the 3rd WMYACC League at Perry Park on the 11th December, finishing his best position of 6th in the U/15 Boys race. In the U/13 Girls race Chloe Everton had her best run of the season for 17th place. On the same day the Telford 10k took place, being one of the best in the country with over a 1000 runners and winning times well under 30min. 3 DASH athletes had good runs with Ian Mansell 138th in 34min 34sec, Ben Foster 144th in 34.41 and Rob Meredith 162nd in 35.28. Good team packing in the 2nd Birmingham League saw DASH finish in 5th place with 297pts and stay in 5th overall. On a new course over undulating ground with 2 climbs per lap, it proved a testing run. After a close tustle on the last lap, Dave Ratcliffe just outsprinted Dave Nation finishing 27th and 28th, with Ben Foster having another good run for 31st.Rob Meredith was 44th as both Scot Palmer and Ashleigh Bentley improved greatly for 73rd and 94th. Martin Harrigan was 106th and Eddie Fletcher making a welcome return was 224th. 247 runners finished the race. The 2nd WMYACC League took place at Warley Woods on Sunday 21st November with a good turnout in both the U/11 and U/15 Boys saw both teams finish a lot higher up the table. Harry Walters in the U/15 Boys continued his good form improving to finish 9th in a time of 12.50, with William Kay just 6 seconds behind in 11th place. Alex Hurrell also improved to finish 34th as the team moved up to 6th overall. DASH move up to 6th as Tamworth have penalty points added for not providing an official. Same day as the Shocker on a more refined course the first WMYACCL took place at Hatton Country Park, Nuneaton. 15 athletes made the journey, with the best run of the day going to Harry Walters in 17th, leading the team to 10 from 20 clubs. Isabelle Plant had an excellent run to take 21st in the largest field of the day with 122 finishers. Well done all athletes for competing !!!! Emma Sherwood wins the Junior Girls High Jump at The English Schools Championships held at Gateshead with a clearance of 1.75m. Nancy Hitchmough takes a Silver Medal in the W65 800 at the Masters European Indoor Championship being held in Ancona Italy. Nancy's time of 2.52.78 was just 0.4 behind the winner Ros Tabor. 3 days later Nancy won another Silver in the 1500 again loosing out to Ros in a time of 5.52.8. Nancy was also part of the GB Relay team for the W65 4 x 200 that also finished in 2nd place. Another Silver Medal!! At Perry Park on the Sunday the younger athletes competed in the final WMYACC League as DASH finished 15th overall from 19 teams. Again only a small number of athletes ran, but good performances from Chloe Everton 23rd U/13 Girls, Alex Hurrell 28th in the U/13 Boys race. Grace Slater finished 24th in the U/15 Girls race and Harry Walters was 24th in the U/15 Boys race. In the final Birmingham League Division 2 race at Gloucester on 13th Feb 2016, DASH senior men finished 9th on the day with 327 points. This moved the club out of the relegation zone. Dave Nation returning from injury was first home in 16th, followed by another athlete making a welcome return, M55 vet Ian Furness in 30th. Dave Ratcliffe had a solid run for 48th, with Ian Mansell 64th and Ashleigh Bentley 75th and 5th Junior overall with Martin Harigan completing the team in 94th place. Scott Palmer ran well for 108th and Simon Vines was 122nd with 191 runners finishing. The following day a small team travelled to Burbage Common for the 4th WMYACC League and Alex Hurrell was rewarded with an excellent run in the U/13 Boys race claiming 12th place. Chloe Everton continued her solid season with 32nd in the U/13 Girls race. With such a small team the overall result saw DASH drop to 18th overall. On a very muddy course DASH Senior Men closed the gap on the teams above them in the 3rd Birmingham League race at Gloucester, but are still in the relegation places, but only 85pts behind Newcastle. Ian Mansell had his best run of the season finishing an excellent 16th in 30.58, as Dave Nation made a welcome return from injury for 24th in 31.38. Another athlete improving through the winter Dave Ratcliffe had a good run for 40th in 32.26 with Junior Ashleigh Bentley in 80th in 33.42. Scott Palmer 97th in 34.14 and Martin Harrigan 116th in 34.48. Darrell Bodin was 143 in 35.44. The team score of 373pts was the best of the season and lifted DASH above Black Pear by 40pts. Leaving all to run for in the final League race. DASH where in action on both Saturday and Sunday over the weekend of the 5th/6th December, as the Senior men tried to close the gap on the teams above them in Div 2 of the Birmingham League. Ian Mansell was again first home for the club in 41st place as Dave Ratcliffe improved 36 places for 54th, with Ashleigh Bentley a solid 67th. Dave Nation making a welcome return from injury, ran steady for 102nd as Darell Bodin in 141st and Scott Palmer 143rd completed the team. DASH will need some good runs in the final 2 meetings to try and avoid relegation. The Sunday saw the younger athletes in action at Warley Woods as the team moved up 2 places to 13th overall, with strong team runs in the U/13 Girls as Chloe Everton 35th and Kiera Avery 57th saw them finish 9th team. Alex Hurrell had another solid run for 33rd in the U/13 Boys, as did Harry Walters with 37th in the U/15 Boys race. The opening Birmingham League Div 2 race at Leamington saw a depleted DASH team competing with Team Manager and Vet Jim Brown forced to run in order to prevent the club being automatically relegated for not completing a team. Jim's efforts paid off, for although we finished 16th of 17 teams, the club is not too many points behind the teams above. Ian Mansell had a good run in the large field for 40th and solid packing from Ashleigh Bentley 78th and 11th Junior, Dave Ratcliffe 90th and Martin Harrigan 97th. Jordan Smith did well for 151st as Jim brought the team home in 234th. At the recent Diamond League meeting at Alexander Stadium, Pam and Eric were given the award in recognition of the service they have given to athletics over the past 60 years. The DK 10k road race, with over 640 finishers, saw Wolverhampton's Phil Nicholls an easy winner, but Dudley and Stourbridge Harriers runners where well placed with Ian Mansell 3rd in 34.51. Dave Nation had a good run for 8th with 35.20, as under 17 athlete Elliot Jones came in an excellent 23rd in 38.01. Darrell Bodin was 52nd in 40.57, another under 17 athlete Ashleigh Bently 55th in 41.02 and Stacey Skitt finished 139th in 45.55 and 5th lady. MEDALS: Dave Ratcliffe. Robert Meredith. With over 440 finishers, Dudley and Stourbridge Harriers athletes where well to the fore in this weekends Action Heart 5 mile Road Race, with Dave Nation having a great run and leading the way to finish in 3rd ,Dave's time of 28min 15sec and was just 4seconds behind the second placed runner. Ian Mansell showed he is returning to some sort of form with 6th in 28.52, as Paul Mountford preparing for the London Marathon ran an excellent 29.57 for 12th. Distance coach Darrell Bodin was 25th in 32.42 as Stacey Skitt finished 55th in 35.36 and 4th lady. Despite suffering from a cold all week Dudley & Stourbridge Harriers athlete Lee Slater still managed a great 2nd place in the 4th and final race in Division 2 of the Birmingham League cross country at Aldersley. Lee held on to eventual winner Ros Jones of W& B for over half of the race before the weeks lack of training took its toll, but with his second Lee secured the overall individual winner for both the best of 3 races and all 4 races. DASH finished 9th on the day and dropped to 7th overall from the 18 teams, but the club still gave a good team performance as Dave Nation had another solid run for 30th, with Ian Mansell, who had already won a Park Run earlier in the morning finishing 54th. 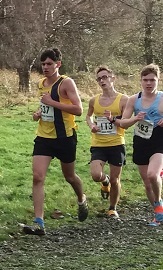 Junior Alex Ashfield in his first senior cross country ran well for 62nd as Scott Palmer was 107th and Jordan Smith 146th to give the club a points score of 401pts. Joe Bolton in 177th place completed the DASH runners. 4th WMYA CC League at Burbage Common. Even though only a small group off athletes made it to Nuneaton they were rewarded with some good performances on a very hard course. Tom Slater in the Under 13 Boys race led the team to great 4th team place. Tom finished in 6th followed by some close packing as Adam Horton was 36th, Harry Walters 38th, Adam Bodin 39th and Alex Hurrell in 64th. Well Done lads. Grace Slater had a good run for 24th place in the Under 13 Girls race as did Chloe Everton for 27th in the Under 11 Girls race. Again Well Done to all those who made the effort.